Background: Dentistry education requires a great deal of hands-on learning as well as content-based learning. Although each individual has a unique learning style, our group of educators sought to understand the predominant learning style preferences of a cohort of 84 dental students. The aim of this study was to investigate the learning style preferences of first, second and third year Saudi female dental students in the College of Dentistry. Materials and method: The research team invited all students at a large, allfemale university in Riyadh, Saudi Arabia to engage in a cross sectional study. This project assessed learning styles using the Visual, Aural, Read-write, and Kinesthetic (VARK) questionnaire. Results: A total of 84 female dental students (more than 3/4 of the entire dental college cohort) returned the completed the questionnaire. The majority (91.5%) were between the ages of 19-22 years old. Just over half of students (54.7%) preferred multimodal learning style preference, meaning that they had no specific strong preference for a single learning style. Of those who had a strong preference for a specific, Kinesthetic (learning by doing) was the most commonly chosen (20.2%). Conclusion: The majority of the female dental students in this cohort preferred a mixed learning method. For those who had a single, strong preference, learning by doing ranked highest. The results of this study can provide useful information for educators of the learning style preferences of students and facilitate student learning by developing appropriate teaching strategies. Relying less on demonstration and more on hands-on and mixed method teaching may be the most pleasurable and productive strategy for this cohort. Saudi Arabia could be seen to be facing an epidemic of poor oral health. According to a large national survey in Saudi , only 11.5% Saudi Arabian people visit dental clinics for routine check-ups or to address oral health issues once per year. The same survey found that 16.3%, 85.0% and 52% of Saudi Arabian people never brush their teeth, never floss their teeth or never use miswak (chewing stick), respectively. As a result, national prevalence of dental caries is high. This was borne out in a study that found Saudi Arabian children to have caries in 80% of primary dentition and 70% in their permanent dentition . A study of pre-school children in Riyadh, (Saudi Arabia’s capitol), revealed that of 388 children aged three to five years old, 69% of them had dental caries . This is high compared to countries such as India with 61%  and Norway with 11% of children having caries by age five . Saudi Arabia has a long history of dental care, and instruction on maintaining oral health. Some people in the country use miswak, which is a twig used since ancient Greek times for cleaning both the mouth and teeth . The miswak twig is usually extracted from bitter tree branches such as palm or olive trees or the roots Salvadora persica. In the past, Saudi Arabia relied on a large proportion of dentists who were trained overseas. Recently, Saudi Arabia has increased the number of dental schools in order to educate more national dentists. Some of these Saudi dental students are being educated at new universities, with new curricula. There is an opportunity to increase the country’s ability to provide evidence-based, innovative and effective education. This will in turn increase their effectiveness at delivering preventative care and treatment, and improve the overall oral health of the population. The aim of this study was to investigate the learning style preferences of first, second and third year Saudi female dental students in the College of Dentistry. To our knowledge, there have been no other studies investigating the learning style preferences of students such as these so far. Dental faculty throughout the world is striving to create and deliver high-quality, effective curricula. Faculty members engage students in learning in the most resourceful and enjoyable ways. In order to do so, faculty must be sensitive to the learning style preference of their students. Much is changing about what and how we teach. Current curricula include evidence-based practice, increasingly complex technologies, and strategies for communicating with better informed patients. Therefore more so than ever, it is important for dental faculty to know the learning style preference of their students and respond to meet their needs. The academic system in Saudi Arabia is unique. Students leave high-school and are streamed into a one or two-year academic bridge programme for health sciences before they declare their interest in studying dentistry. The Dental College at a large, allfemale university in Saudi Arabia was the setting for this study. The College offers a unique curriculum, which is a hybrid between traditional instruction and problem based learning. The subjects are taught using mostly a block system, with a few stream subjects on a yearly basis. After a pre-clinical program period, students are asked to rank their top 10 choices for profession. Their preference, along with their marks and an interview are combined, resulting in a decision on the college that they will study in. Dentistry is one of the most popular colleges and ranks high on student preference, second only to Medicine. Therefore, while individual students have some input into which College that they will study in, it may not be their intended academic goal? Furthermore, as reading and writing are important components of success in the bridge program, students with a preference for this style would likely have scored higher in this area than most students, but perhaps not as high as those in Medicine. Learning Style Preference describes an individual’s predilection for understanding his or her experiences and transforming what they understand into knowledge . There are forces steeped both in nurture and nature that make the same teaching method effective for some students and ineffective for others . There are many learning style inventories [7-9]. One of the most common and widely used categorizations of the various types of learning styles is Fleming's VARK (Visual, Aural, Read/ Write, Kinesthetic) learning styles inventory . This inventory can be found on VARK’s website at http://vark-learn.com/. Fleming based his inventory of learning style preference on the senses. He proposed that visual learners have a preference for seeing, auditory learners learn best through listening, and tactile/kinesthetic learners prefer to learn via experience. Some students also prefer to learn via reading and writing (information is displayed as words) . The VARK learning style inventory was tested for reliability coefficients, which were found to be adequate. Dental faculty can use the knowledge of learning style preferences, to vary the way that they deliver information and play to the strengths of their student population. Miller  reported that when students were taught in their preferred mode of learning, their learning was enhanced. Students can also use the model to identify their preferred learning style and maximize their educational experience by focusing on what benefits them most . Several studies using VARK have been reported in the literature. These studies originate in different countries around the world using the VARK questionnaire on dental students investigating their learning style preferences. VARK studies involving dental students were found from India [13-18], Romania , Pakistan [20-22], Poland  and in the United States of America . These studies from other countries showed a variety of results of learning style preferences among dental students. In practice, most students worldwide prefer to learn in several ways (multimodel). There have only been two studies done in Saudi Arabia to determine the learning styles of undergraduate dental students using the VARK questionnaire [25,26]. Both were done in the College of Dentistry at King Saud University. One study  measured learning style preference in year one to year five male dental students. The researchers concluded that the learning preference did not differ between undergraduate students from first to final years. This study found that 58.4% and 41.6% of the students had multimodal learning preferences and uni-modal learning styles, respectively. This population’s learning styles reflected strong kinesthetic and aural preferences. Another study from Saudi  using the VARK questionnaire investigated first year dental students and compared students of both genders. This study looked at the relationship of students learning style preference to Gender and Past Academic Performance (GPA). The researcher found that 59% of students were found to have multimodal learning preferences and that there was a statistically significant difference in the mean values of GPA in relation to the student’s learning style preferences. This cross-sectional study was conducted at the end of the academic year of 2015. The research team distributed the Visual, Aural, Read/Write, and Kinesthetic (VARK) questionnaire version 7.1  in several dental classes. This questionnaire was in the English language, which is the language of instruction at the College. Students were asked to complete the questionnaire and return it to the research team. The students were reminded that all participation was voluntary. Instructions for answering the questionnaire were provided to the students with a cover letter that gave the purpose of the study, confidentiality assurance, consent and the email of the principle investigator. The VARK tool was distributed to the entire undergraduate student population including first year (n=44), second year (n=35) and third year (n=31) students. All students were invited to participate in the study, and most of those were present chose to purchase (84/111, 79%). This was an adequate sample size, as our original calculation for such a small group required that we get at least 81 participants in order to reach a 5% margin of error and a 95% confidence level. After the completed questionnaires were collected, the distribution of VARK preferences were calculated according to VARK website guidelines . The percentage for each VARK modality and possible combinations of modalities according to the number of students who preferred each learning style was divided by the total number of students. Statistical analysis was done using SPSS version 21 (New York, USA). Permission to carry out the study was obtained from the Dean of the College of Dentistry. Ethical approval was sought and obtained by the research team from the College of Dentistry Ethics Committee. The study was explained to the dental students who volunteered to be a part of the study. Students read and signed consent forms to indicate that they agreed to participate the study. It was explained to each group of students that they had the right to refuse to participate in the study at any time. Most of the students participated in the study, with 84 of a possible 110 students enrolled in the College of Dentistry, completing the questionnaire (76%). There were 31 students from first year (37%), 26 students from second year (31%) and 27 students from third year (32%). The majority (91.5%) of students were between the ages of 19-22 years old and all were females and of Saudi nationality. The prevalence of different learning styles is described in Figure 1. Students who had no strong preference for any learning style (multimodal VARK) made up the largest group (21.4%). Slightly fewer students (20.2%) had a strong preference for learning by doing (kinesthetic). This was followed by unimodal Visual, Aurel (listening and speaking) and Read/write (all 8.3%). Distribution of unimodal learning styles is shown in Figure 2. Kinesthetic had the highest prevalence with 20.2%. Figure 1: Prevalence of student learning style preferences. Figure 2: Distribution of unimodal learning style preferences. Comparisons were made across the cohorts, by year of study. 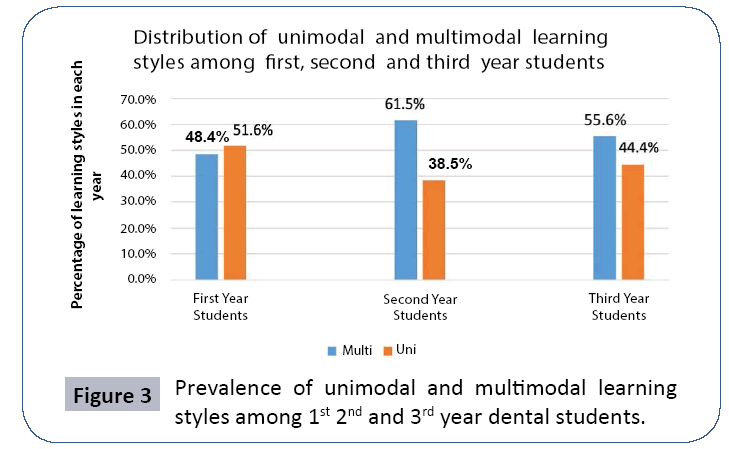 Prevalence of unimodal and multimodal learning style preference among first, second and third year dental students is shown in Figure 3. 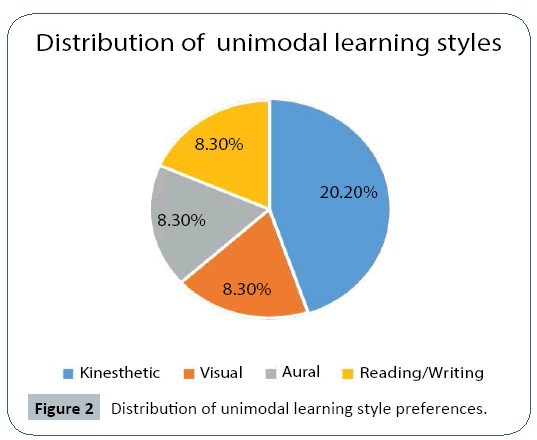 Figure 3: Prevalence of unimodal and multimodal learning styles among 1st 2nd and 3rd year dental students. Prevalence of multimodal learning style preference was higher in year 2 (61.5%) and year 3 (55.6%) compared to unimodal learning style preference (38.5% and 44.4% respectively). Unimodal learning style prevalence was only slightly higher in year 1 (51.6%) compared to multimodal learning style prevalence (48.4%) (Table 1 and Figure 3). Table 1: Prevalence of different learning styles among 1st, 2nd and 3rd year dental students. The current study suggests that this group of female dental students had varied learning styles with multimodal VARK and unimodal kinesthetic being the most dominant. There was a difference in learning style prevalence among first, second and third year female dental students which is a different finding than was seen in a previous study . In the 2015 VARK study of Saudi male dental students, there was no different in learning style preference between the first and final years. In the current study of Female Saudi Dental students, the first and third years were most often unimodal kinesthetic whereas for the second year students, they were multimodal VARK. Figure 4 described the breakdown of results found in studies from the literature, to compare with the current study on learning style preferences of Saudi female dental students. Among the studies from Saudi Arabia [25,26], the results do not differ greatly between the studies that looked at males versus females. The unimodal preference for visual learning is higher in all other cultural groups than the Saudi cohorts, except in India. Of interest to many content-heavy curricula (as in dentistry), is the unimodal preference of reading and writing. While Saudi female dental students were more likely to prefer this learning style than males, there were few in any of the cohorts who were unimodal Read/write. Saudi students both male and female had higher unimodal preference for learning by doing than any of the other cohorts of dental students in the comparison. Figure 4: Results from the literature: measuring dental student learning styles preference, using VARK. When students enjoy the information presentation or engagement, they are more productive and likely to learn. This study showed that there is a wide variety of learning style preferences among female dental students in this cohort. Instructors in the Dental College were given a report of these results in order to encourage awareness of the important of teaching styles and learning preference. Developing teaching methods that complement a wide range of learning styles appears to be more effective than attempting to tailor the course content to the individual student . The current curriculum at this College of Dentistry includes a hybrid of Problem Based Learning and traditional lecture-based methods. The curriculum engages in most of the ways of encouraging student learning that are suggested by the VARK website. A focus on kinesthetic learning is dominant as the students engage in a high proportion of lab and clinical courses. Of the total sample, multimodal learning style preference was more prevalence than unimodal. This finding is consistent with other studies [19,24,26,27] that showed similar results. Other studies [16,20,22] reported that the population of dental students that they measured preferred unimodal learning styles. One of the questions that have been asked by researchers in the literature is at what age learning style preference is developed and if it can change . A study of Saudi Arabian children in grades seven and eight years old found that 48% were multimodal and the others were unimodal (v-12, A-4, R-12 and 24 K) . This finding does not vary greatly from the findings in the current study. When this study sample was divided into year of study, the unimodal learning style prevalence was only slightly higher in prevalence for the first year dental students compared to multimodal learning style prevalence. For the second and third year dental students, the multimodal learning style preference was much higher than unimodal. This may represent a cohort effect or perhaps variations on how students were selected for access to the Dental College. However, a recent study from Australia reported that 45% of students measured before and after starting nursing education maintained the same learning style preference (according to the VARK questionnaire) after one year of follow-up. About a third of the students in that study became more multimodal . In this study, the kinesthetic learning style was the dominant unimodal learning style whereas the other learning styles (V, A, R) had a much lower and equal prevalence. Two previous studies in Saudi dental students [25,26] reported high proportions of both kinesthetic and aural learning style preferences, as did a study from the same Saudi university (PNU), measuring the VARK in a population of Nursing students . Murphy et al. , found in a population of US dental students; the read/write and visual preferences were more dominant. Difference in the prevalence of learning preferences between these studies may be explained by the difference in age, gender, culture and academic level of the students that participated in these studies. These cohorts of Saudi Arabian female dental students were highly multi-modal. While culture and gender may play a role in learning style preference, how academic systems select students for professional programs like dentistry may heavily bias the findings. All learning styles being equally preferred (VARK) was the most common preference. This was closely followed by unimodal kinesthetic learning style preference. The results of this study can provide useful information for dental educators of the learning style preferences of their dental students and facilitate student learning by developing appropriate teaching strategies. Oral health, which affects general health in Saudi Arabia, has been traditionally very poor compared to other countries. However, new curricula and new programs for training national dentists have a great opportunity to provide community-based and preventative dental services. This cohort of female Saudi national students is at the forefront of the reformation of the dental system in the country. By understanding the way that the students learn, dental faculty can improve the way that they teach. Students who enjoy learning, will learn more efficiently, also enjoyed teaching others. In the way, dental students can learn to teach their patients, which is an important part of encouraging oral health. Dental faculty can provide guidance on how to improve the quality and the experience of dental education in Saudi Arabia. All of us who are responsible for educating the next generation of dentists must pay attention to the learning style preferences of the students that they teach. In the case of this cohort, we recommend that faculty use learning activities that involve movement and experiential learning techniques. El Bcheraoui C, Tuffaha M, Daoud, F, Kravitz H, AlMazroa MA, et al. (2016) Use of dental clinics and oral hygiene practices in the Kingdom of Saudi Arabia, 2013. Int Dent J 66: 99-104. Al-Agili DE (2013) A systematic review of population-based dental caries studies among children in Saudi Arabia. Saudi Dent J 25: 3-11. Al-Meedani LA, Al-Dlaigan YH (2016) Prevalence of dental caries and associated social risk factors among preschool children in Riyadh, Saudi Arabia. Pak J Med Sci 32: 452-456. Singhal DK, Acharya S, Thakur AS (2015) Dental caries experience among pre-school children of udupi taluk, Karnataka, India. J Oral Health Comm Dent 9: 5-9. Wigen TI, Espelid I, Skaare AB, Wang NJ (2011) Family characteristics and caries experience in preschool children: a longitudinal study from pregnancy to 5 years of age. Commy Dent Oral Epidemiol 39: 311-7. Tubaishat R, Darby M, Bauman D, Box C (2005) Use of miswak versus toothbrushes: oral health beliefs and behaviours among a sample of Jordanian adults. Int J Dent Hyg 3: 126-136. Cuthbert PF (2005) The student learning process: Learning styles or learning approaches? Teach Higher Educ 10: 235-249. Dunn R, Beaudry JS, Klavas A (1989) Survey of research on learning styles. Educ Leadership 46: 50-58. Felder RM, Brent R (2005) Understanding student differences. J Engr Educ 94: 57-72. Fleming ND (2015) Vark: a guide to learning styles. Leite WL, Svinicki M, Shi Y (2010) Attempted validation of the scores of the VARK: learning styles inventory with multitrait-multimethod confirmatory factor analysis models. Educ Psychol Meas 70: 323-339. Miller JA (1998) Enhancement of achievement and attitudes through individualized learning style presentations of two allied health courses. J Allied Health 27: 150-6. Anita K, Saee D, Jayashree J (2014) Evaluation of learning styles of dental students: a preliminary investigation. JETHS 1: 34-38. Narayana Murthy C, Ramesh VL, Gowramma R (2014) A study on VARK learning style of SJM Dental College and Hospital students Chitradurga. J Educ Res Med Teach 2: 33-36. Shah K, Ahmed J, Shenoy N, Srikant N (2013) How different are students and their learning styles? Int J Med Sci 1: 212-215. Shenoy N, Shenoy K, Ratnakar UP (2013) The perceptual preferences in learning among dental students in clinical subjects. J Clin Diagn Res 7: 1683-1685. Kumar BJ, Sushma S, Naresh K, Kumar BB, Ajay S, et al. (2011) Differences in learning style preferences of medical, dental and B pharms students. Int J Med Med Sci 1: 037-041. Dumitrescu, A, Badita, D (2014) Learning styles of first year Romanian dental students. Proc Physiol Soc 31: C79. Haq SM, Yasmeen S, Ali S, Gallam FI (2012) StudentsÃ¢ÂÂ learning styles requires modified teaching strategies. J Rawal Med Coll 16: 191-193. Khalid MS, Haroon SQ, Muhammad SK, Umar F (2012) Learning style preferences of dental students in Islamabad Medical and Dental College. Pak Oral Dent J 32: 326-329. Siddiqi KM, Qazi HS, Kurram MS, Farooq U (2012) Learning preferences of dental students at Islamabad medical and dental College. Pak Oral Dent J 32: 326-329. Kaczmarek U, Smulczynska A, Grzesiak-Gasek I (2010) Learning styles of students. Dent Med Probl 47: 193-198. Murphy RJ, Gray SA, Straja SR, Bogert MC (2004) Student learning preferences and teaching implications. J Dent Educ 68: 859-66. Asiry MA (2015) Learning styles of dental students. Saudi J Dent Res 7: 13-17. Al-Saud LMS (2013) Learning style preferences of first year dental students at King Saud University in Riyadh, Saudi Arabia: Influence of gender and GPA. J Dent Educ 77: 1371-78. Hughes JM, Fallis DW, Peel JL, Murchison DF (2009) Learning styles of orthodontic residents. J Dent Educ 73: 319-327. Mitchell EL, James S, D’Amore A (2015) How learning styles and preferences of first-year nursing and midwifery students change. Aus J Educ 59: 158-168. Saadi IA, Watt AP, Eldin, Elhassan ASEA (2013) Predominant learning styles in Saudi preparatory schools. J Am Sci 9: 140-152. Stirling B, Alguiraini W (2016) Using VARK to assess saudi nursing students’ learning style preferences: do they differ from other health professions? J Taibah Univ Med Sci.